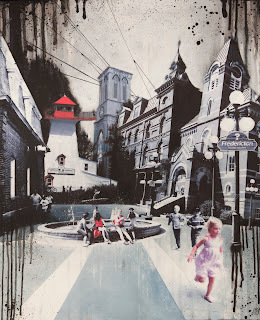 I’ve finally had the time to put my latest pieces online; ‘Fredericton’ and ‘China Town’. It seems like ages ago that I finished them but now finally everyone can enjoy them. Even though I spent the entire week in my studio last week I still feel like I’m getting back into the rhythm of things. The past couple of weeks have been filled with trips, preparations for my show and paintings that needed to be finished, which meant that I didn’t have time to go out and take photographs for my boroughs project. Now that I’m not working on quite as many paintings at the same time and I have actually planned my weekly photography outings again, I feel like things are getting back to normal again. I like my rhythm and I think I function best when it’s there although working under pressure can be exhilarating and refreshing at times. At the moment I am working on the first piece for my collaboration project, that piece is almost finished. I am also working on the first piece of my Boroughs project, the photographs have already been transferred to the panel so that one’s also in the final stages. I’ve got a couple of other things going on as well; I’m doing a small commission piece on Montreal and I’m going to start work on a piece that I want to donate to YES Montreal. On top of that I’ve already got a couple of other pieces planned as well, the first being a piece on Halifax. The last week of September we’ve got a trip to Italy planned, we’ll be driving from Rome to Venice! I’m very excited about that because it will give me a huge amount of new material to work with, I’ve always wanted to do a piece of Rome! So lots of good and exciting stuff going on but, first things first, let’s finish this collaboration piece! I am very excited to officially announce my collaboration with Montreal portrait photographer Pazit Perez. We will be working together on a whole new body of work in which we will combine both of our talents. We’ve almost completed the first piece in the series and hopefully there will be many more to come. Next to creating a series of original artworks we’re going to experiment with different ways to reproduce the images. Both Pazit and I will keep you posted on the developments. Most of you will know that past Friday was opening night for my show ‘URBAN’ which is being held at the Viva Vida Art gallery until September 1st. The event was a great success! We had a good turnout and the atmosphere was amazing. I was very pleased with how everything looked and the blue lights that were installed in the window for the occasion really made a big difference, especially on the photographs. (you can check out the photographs and video here) The gallery had arranged a DJ for the occasion which really gave the whole event an extra edge. I met so many great people and enjoyed talking to everyone immensely. On Saturday I had another chance to meet some great new people during my artist presentation. I spent four hours working on my Pointe Claire piece while talking about my process to all the people that came in. I would like to thank everyone that came out on Friday or Saturday. If you haven’t been able to go to the gallery yet, the show will run until September 1st 2011. The Viva Vida Art Gallery is located on 278-2 Lakeshore Road in Pointe-Claire. Vernissage tonight, artwork demo tomorrow! Tonight, Friday August 19th, is the vernissage for my show at the Viva Vida art gallery in Pointe Claire. The timing is perfect because the village of Pointe Claire is celebrating it’s 100 year anniversary this weekend and there will be all kinds of activities tonight and over the weekend so we hope to get some extra traffic from that. On top of that the weather is going to be gorgeous so that should get people out and about as well. I’m really excited for this one! I was at the gallery yesterday to help hang the show and I really like the idea’s Nedia, the gallery owner, has for the whole atmosphere and feel of the show, it’s going to be funky! Some people have been asking me if there would be any work of my ‘Montreal Boroughs Project’ represented at the show. Unfortunately this project is still very much in development so there just isn’t that much to show yet. I will however be working on the first piece of the series at the Viva Vida art gallery in Pointe Claire on Saturday August 20th from 1-4pm. Conveniently this first piece is on Pointe Claire so that nicely fits the theme of the festivities. This will be the first official sneak peek of the Borough Project! The piece is at the stage where the photographs can be transferred to the panel so if you stop by you can see how that is done and get an idea what the piece is going to look like. If things go smoothly I might even have time to start painting! I hope to meet you all tonight, Friday August 19th, from 7-10pm at the vernissage or tomorrow, Saturday August 20th from 1-4pm! If you can’t come out on such short notice the show will run until September 1st. The Viva Vida Art Gallery is located on 278-2 Lakeshore Road in Pointe-Claire. With my show coming up this Friday I’ve been quite busy with the final preparations. Granted, I have a lot less to prepare this time because the Gallery is taking care of a lot of the preparations for me but there are still last minute pieces to finish, pieces to frame and wire and a ton of little things to take care of. So needless to say I’ve been quite the busy bee this past week. At one point I was working on four separate pieces at once which was the cause of quite some confusion and a very messy and full studio. As you know my work requires several layers of gel that need a certain amount of drying time. this means the pieces cannot me stacked. I have a small dry line that runs the length of my studio but one of the pieces I’m working on is quite large and requires elements that are spread over four to six 11x17 pieces of paper so my dry line only supported four pieces which meant all the other pieces were on the floor. Usually this is not that much of a problem but this time the floor was already occupied by gelled pieces of paper for two other pieces, one of which was ready for transfer to the panel. And on top of that I had another half finished piece lying around as well. When I transfer my photo’s to the panel, the panel needs to be lying flat on the floor as well and I need some place to sit and apply my medium and paints so for a while there it was a bit tight. Things are slightly better now, the large pieces are still drying so half of my studio floor is still taken up by that but two of the four pieces I was working on are almost finished. About time too because I want them to be in the show on Friday. I have to say I do like to be this busy, especially when I’m busy making art :) I have two solid projects to work on, both containing more then one piece and I’m going to do a commission and a donation piece in the near future. And this is all next to all the single pieces that I have lined up :) Life’s Good! 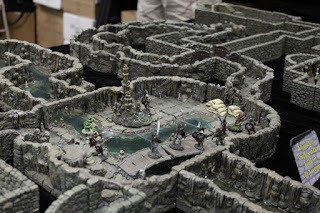 Saturday was hubby’s birthday and as a present he wanted to go to Gen Con. What is Gen Con you ask? Well, it’s a place where all geeks meet to play designer board-games. This event takes place in Indianapolis which is about 15 hours from Montreal. 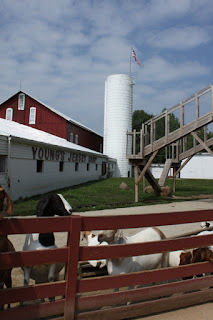 On Thursday we drove all the way to Cleveland, with a little stop in Buffalo for lunch. I managed to get some great shots of Buffalo’s architecture so maybe there will be a Buffalo piece in the future. On Friday there were only 5 hours of driving left, we did have to make a little D-tour to Young’s Jersey Dairy for the best milkshake in the world. We arrived in Indianapolis around 2pm and drove to the convention center right away to check out the convention. After we picked up our badges and checked out our goody bag we spent the afternoon exploring geek heaven. There were games being played everywhere! 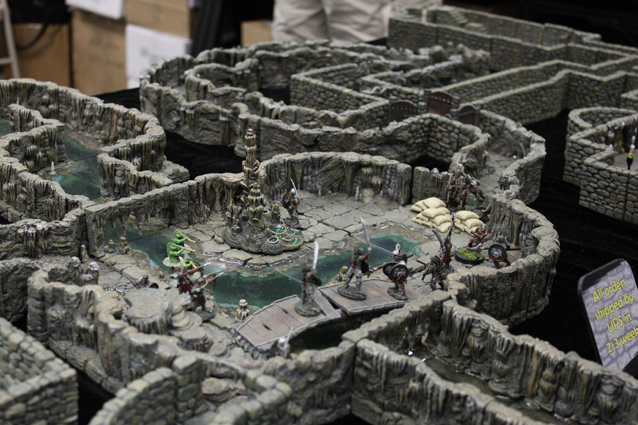 There was an area for people who had created there own dungeons to play games like Descent, amazingly detailed creations with fountains, treasures and dragons. We checked out the art exhibit en everywhere you looked there were tons of new and old games to play. In the exhibit hall I was overjoyed to encounter my first TARDIS! 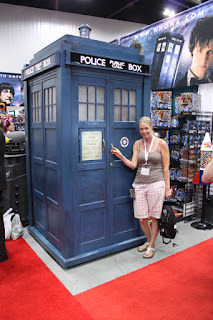 I’m a huge Doctor Who geek so getting your picture taken with the TARDIS is a big deal, my weekend was made at that point and we hadn’t even started playing games yet! On Saturday we had a full day at the convention and we made the most of it by trying out a ton of new games and scoring some nice deals on some of them as well. We played until 9 in the evening after which our brains were pretty much fried from learning so many new rules. We had to start out drive back home on Sunday morning and since we didn’t want to drive 15 hours straight we had packed our camping gear for a night our in the woods. We had to drive 10 hours to the camp site and arrived just in time to pitch the tent before dark. We were both pretty exhausted after that 10 hour drive so after dinner we crawled into our cozy little tent for a fitful night of sleep in the fresh air. Unfortunately we hadn’t checked out air bed before we left and in the middle of the night we woke on the hard forest floor instead of our nice air cushioned bed. Luckily we own one of those electric pumps so we didn’t have to blow it up ourselves. It wasn’t so fortunate for the other campers though, because our pump sounds like a vacuum cleaner, not the nicest sound in the middle of the night, I think by morning the whole camp-site knew we had a leak. 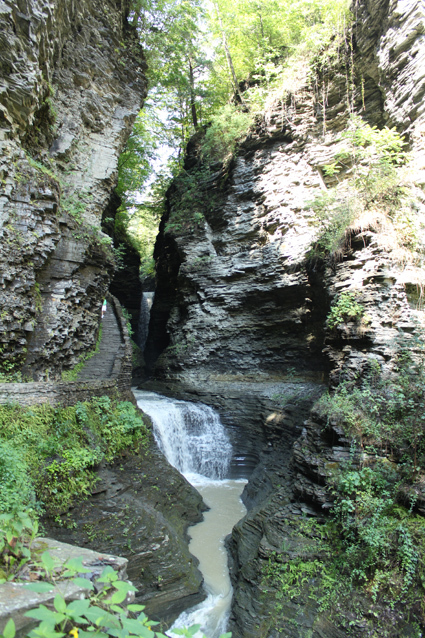 We had chosen our camp-site because it was close to this gorge you could walk through. So after breakfast we packed up our stuff and went for a beautiful walk. The gorge was absolutely gorgeous! 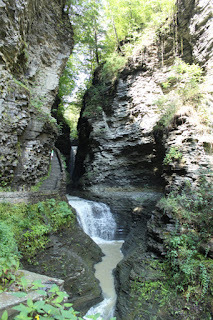 with beautiful waterfalls and amazing rock formations.We were imagining ourselves in this fairytale world where we would be hiking to the castle to visit the dragon. From August 19 to September 1st the works of international artist Denise Buisman Pilger will be featured at the Viva Vida Art Gallery in Pointe Claire. 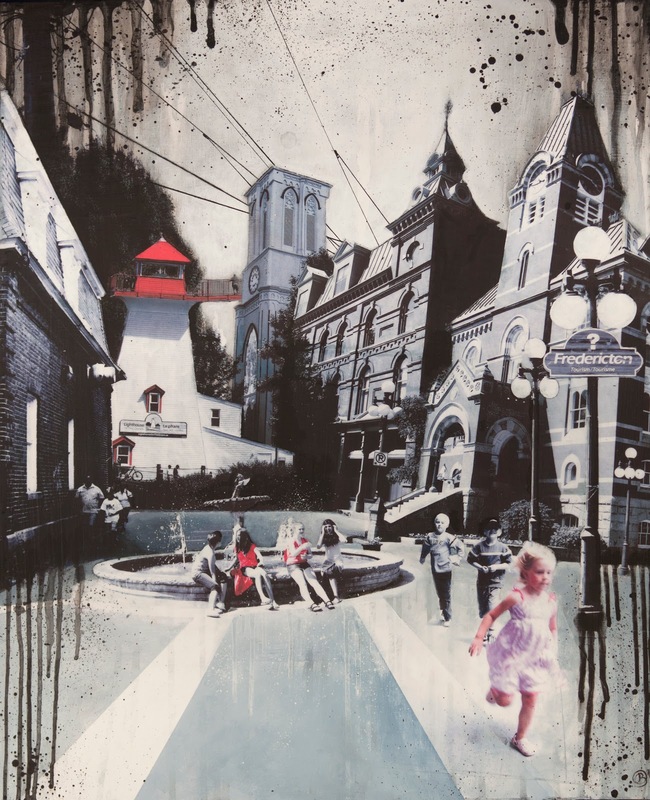 ‘URBAN’ will show you surreal interpretations of North American cityscapes, reflecting the artist’s off-beat view of the world. The Viva Vida Art Gallery has recently moved to a beautiful new space on Lakeshore Road. The airy, contemporary space offers the perfect atmosphere for this urban themed, mixed media show. The public is invited to the opening reception for ‘URBAN’, which will be held on Friday August 19 from 7-10 pm. 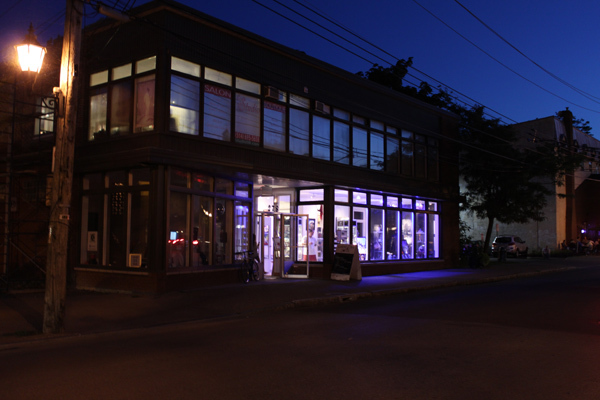 The Viva Vida Art Gallery is located on 278-2 Lakeshore Road in Pointe-Claire.